We get a lot of questions from our customers about products, so we would like to use our blog as a place where we give you more information about the art materials we supply and what they can be used for. When selecting which ink to use it can be difficult to understand which you should select, especially when you are trying to choose between two black inks, like drawing or Indian ink. So to help clear things up we’ve put this article together to help you understand which ink you want to select for your projects! Which ink should I choose? There are various types of ink which you can buy, and the one you select for your work will depend upon factors such as application, what ground you are working on, what effect you are hoping to achieve and possibly how the work is going to be seen by your audience. Dye based inks are produced using a series of soluble dyes in solution, often shellac. Dye based inks should be used when the main aim is the purest, most vivid colour. However, dye based colour has a lower lightfastness and so is better for work which will be kept in protected conditions such as a sketchbook or portfolio rather than on permanent display where the colour will deteriorate faster over time with exposure to light. Shellac Dye based inks are usually water resistant, and produce the best effects when used on paper, Bristol or illustration board and when used with dip pens or brushes. Dye based inks are not recommended for use with fountain pens as the particle size of the dyes may cause clogging and damage the nib. iartsupplies sells three ranges of dye-based inks, the Ecoline liquid watercolour ink range in which all colours are dye based except for the white and the gold, the Waterproof Drawing ink except for the white and black colours and the Dr Ph Martins Radiant Inks. The exceptions in the ranges are both pigment based and have improved lightfastness as a result. With the black drawing ink, choose this when you want a black which will provide you with a greater possibility for shading work and gradations of the colour as opposed to Indian Ink. The Ecoline and Radiant inks do not contain shellac and are not waterproof, but the Drawing ink is once dry. Acrylic Inks such as Daler Rowney FW are made using pigments the same way that paint is. These inks are best for those of you who need a fluid versatile colour with the highest possible lightfastness. Compared to dye based inks, Acrylic inks have slightly less colour intensity but due to the better lightfastness are less likely to fade. Acrylic inks are waterproof and permanent once they dry and you can mix them with any acrylic paint and acrylic mediums giving them great versatility! Acrylic inks work best on paper, board and canvas, but will also take on plastics, wood and ceramics. If you choose these inks you should use a brush, dip pen or a technical pen or airbrush. Acrylic inks are also great for stamping, screen printing, fabric printing and stencilling. Black Indian ink is mostly used as a drawing ink. Indian ink is generally produced using lampblack pigment combined with a gum binder and which becomes liquid when mixed with water. Indian Ink got its name from the fact that the materials used to make it were originally sourced on the sub-continent, but you may also hear it referred to as Chinese ink, as that was the country where great use was originally made of it, around 3000 BC. Indian Ink is most generally sold in liquid forms in bottles. Indian ink is water resistant once dry. Indian Ink can be used with technical pens, fountain pens, calligraphy pens, brushes, airbrushes and dip pens. Indian Ink is generally much denser and blacker than many other pigment based black inks. This makes it great for covering large areas and block black work, such as in comic book illustration. Here’s an interesting tutorial for the ways that bleach can be used with Indian ink! DO NOT USE with fountain pens, dye particle size may cause clogging and damage nib. Great for stamping, screen printing, stencilling and fabric painting. Use on paper, board and textured papers. Use with technical pens, fountain pens, calligraphy pens, brushes, airbrushes and dip pens. This entry was posted in Pen & Ink, Tips and Hints, Ideas & Inspiration, Articles and tagged indian ink, ecoline ink, dye based ink, acrylic ink on September 25, 2015 by Fiona Machugh. Focus on Artists Blog - Lisa Congdon. Every month we are going to share with you an artists' blog of our choice. This is for us to help you get inspired and have you being creative for yourselves. We are all creative in some way and sometimes it can just take that little encouragement to help get you going, whether it is an art blog, a particular painting you have seen, paint supplies that you see as you browse an art shop, or even just in everyday living of your surroundings. The internet is always at hand nowadays and we can easily look up anything at a few clicks of a button and soon be inspired. We all find inspiration from different sources and one of them being Artist's Blogs. I have just discovered the talented and amazing fine artist, illustrator and author Lisa Congdon. Living and working in Portland, Oregon, Lisa specializes in abstract paintings, pattern design, intricate line drawings and hand lettering. Amongst many of her clients are Martha Stewart Living, Cloud9 fabrics, Chronicle Books and Harvard University. She is a daily blogger and has written 5 books so far; How to Draw a Tulip in Twenty Ways and The Essential Guide to building your own career as an artist are just a couple of them. You can read about the artist and more in the below link. Lisas' pattern designs are featured with Chasing Paper for wallpaper, with her very own collection, which looks awesome I must say. This wallpaper with Chasing Paper is not just any wallpaper, it is a special wallpaper which is designed and manufactured to be re-movable which will stick to nearly any surface, how cool to be able to have removable wallpaper in your home, office, hairdressers, etc. Just incredible! I mean you could not find or get anything better than this really. Look at her awesome artwork on this link here. This entry was posted in Ideas & Inspiration and tagged illustration, painting, artists blog, author on September 24, 2015 by raxxar. Are you Britain's Best Hobby Artist? Like to paint, but only as a hobby? Well here is your chance to become Britain's Best Amateur Artist by entering in on this Painting Competition which will be open from September 28th to October 31st. Find out more information on this link . Step out of your comfort zone and see what happens. You will never know what could come of it if you do not give it a go. If you do decide to enter, and need some art supplies then pop in to our art shop in Dundee, Perth Road, or you can order online via our website or on Amazon. Have a go at winning yourself a painting holiday from this competition. Not to be missed! This entry was posted in News, Competitions and tagged art, painting, competition, hobby on September 24, 2015 by Natalie Jane Wallace. I just recently found this article on everything you really need to know about Cobra Water-soluble oils. The artist Lori McNee tells us all about why she uses them and gives us the lowdown on the facts of these oils plus her very own hints and tips. It is a bit of a read but, highly recommend you read it as it is most helpful and does summarize the use of these oils and explains really how remarkable they are. Having used the Cobra oil paints myself I truly found this article to be valuable to me and know it will benefit me in the future whenever I pick up my palette knives again. Read the article HERE just to find out for yourself how awesome the Cobra oils are and be inspired once you have picked up Loris hints and tips. Below is just one of Loris beautiful oil paintings "en plein air" Rain Roses. This entry was posted in Articles and tagged artist quality, cobra, oil paint, solvent free, Lori McNee on September 18, 2015 by Natalie Jane Wallace. The DJCAD (Duncan of Jordanstone College of Art and Design, Dundee) Masters show is a necessarily more sedate affair than the undergraduate show which precedes it by a few months. The emptying of the city during the summer months means that the numbers of visitors to the show both on the opening night and during its week long run is significantly less than its sister event. However, this should in no way be interpreted as attendant on the quality of the work on display which this year particularly was of exceptional quality. The master’s programmes offered by DJCAD ensure that the Master’s show provides a wide variety of art and its applications that goes way beyond traditional fine art. With Medical and Forensic Art, Art, Society and Publics, Fine Art and Humanities and Animation and Visualisation programmes there was something for everyone to engage with. In the Forensic Art programme, visitors could look at the application of medical art to develop learning tools, to show the difficulty in creating police composite sketches and to create facial reconstructions from human remains. The work by Amy Thornton on the facial reconstruction of the nineteenth century poisoner and pirate Alexander Tardy from a cast of his skull in the University of Edinburgh Anatomy Museum and Hannah Isaacs reconstruction of a male skull from the Edinburgh Trams project illustrate perfectly the points at which art, history and science intersect. Anatomy was an important part of the training of Renaissance artists, with Leonardo Da Vinci in particular conducting his own dissections in order to achieve greater understanding of the human form which he reproduced. The Forensic Art programme combines this great tradition with the latest in digital and manual reconstruction techniques. Leading on from this is also the Msc in Medical Art, The highlight of this programme was Claire Taylor’s book project “Understanding Terminal Cancer”, aiming to provide a resource for people with a terminal cancer diagnosis with the scientific aspect of their diagnosis and prognosis. This laudable ambition, to increase patients’ agency by increasing their access to information which helps them to fully understand their predicament shows that art can be used not just for scientific and educational purposes but also to benefit people in a very difficult life situation. In the Art, Society and Publics show the highlight for me was undoubtedly Penelope Matheson’s project “Nest of Gentlefolk” a series of surreal arrangements of animal ceramics, reminiscent of the creations of Hieronymus Bosch and early Dali sculptures. These intricate and interesting pieces which also showed a high level of technical skill seemed to transform as one changed ones view points, and for me were one of the highlights not just of that particular course, but of the entire show. The Fine Art and Humanities programme was the biggest section of the show and displayed a variety of work with disparate concepts, techniques and impacts. Sekai Machache’s show “Mashavi” explored the issues of African women’s identity in relation to the manipulation of hair, specifically around the tradition of braiding. Her work combined painting, photography, sculpture and sound work to create a space which explores the braid as a cultural artefact as well as a hairstyle. Jae Ferguson’s delicate and intricate drawings of organic structures provided a great satisfaction to visitors who wanted to see more technique than just good conceptual work. The perfection and simplicity of these pieces were refreshing and different in a world which is so often more concerned with the idea behind the work than the technical quality or what is produced. The animation course produced a series of entertaining and beautiful shorts, supported by extremely advanced supporting artist work. Particularly outstanding in this respect Bimpe Alliu and Christina Maul with the animated music video “Hell Well” being the most coherent and entertaining stand alone piece on the show reel. The opening night of the show was a thoroughly enjoyable evening with far more space to move around and look at the work than at the over attended undergraduate degree show earlier this summer. The artists showing were friendly and on hand to speak about their work during the rest of the week as well as at the opening. At this link you can find full listings of all of the artists exhibiting as well as information on how to contact them and follow their progress. iartsupplies would like to wish all this years graduates the best of luck in what promise to be bright artistic futures. This entry was posted in Blog Home, Articles and tagged medical art, fine art, animation on September 18, 2015 by Fiona Machugh. Famous talented artist J.M.W Turner built his own lodge in Sandycombe, Twickenham, which he designed for himself in 1813. The beautiful building which has been looked after and raised funding for restoring it, has been open to the public since April this year til October once a month allowing visitors to come along and see the famous artists' stunning lodge. Interested to see it and learn more then click here and get the details of when you can visit, only small problem is there is no parking so you are required to hop onto a train to visit. This is a "must go and see" for me after studying so much about the artist myself whilst at art college. This entry was posted in Blog Home, Videos and tagged art, oil paint, watercolour on September 17, 2015 by Natalie Jane Wallace. Want to make use of some calligraphy script but don't have the time or materials right now to learn how to use a purpose pen? 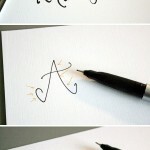 Don't worry, we've found this great hack for you which shows you how to use fineliners to create calligraphy like writing. This entry was posted in Pen & Ink, Tips and Hints, Ideas & Inspiration and tagged writing, calligraphy, pens, fineliners, tips on September 10, 2015 by Fiona Machugh. What causes winkling in Oil Paints? It’s not a pretty sight. Usually we associate wrinkling with age, but if you have found your oil paintings wrinkling, age is not the cause! It is the drying process that is top of the list, with possible combinations of paint quality, colour, and your technique also contributing to the issue. If you want to know how to avoid it, then read on! Wrinkling is caused during the drying process when the surface of the paint layer dries faster than the body of the layer itself. As oils (linseed, poppy, safflower etc.) have a chemical drying process by oxidation and obviously the oxygen from the air reaches the surface of the paint quicker and more easily than the paint underneath. If the surface then dries to a closed film, this effectively blocks the oxygen to the paint underneath. As the oil is expanding by the addition of oxygen molecules, the surface of the paint layer tends to expand faster than the paint on the inside, especially when the surface does dry to a closed film. Then the difference in expansion causes wrinkling. First of all when the paint contains a relatively high percentage of oil, which is the case with very fine (transparent) pigments. Pigments in oil colours are surrounded by oil, and if the pigment particles are (relatively) very small, the collective surface of the pigments is huge and a significant quantity of oil is needed. The more oil (or put another way, the less volume of dry “breathing” ingredients), the more closed the superficial film and the higher the risk of wrinkling. The second reason can be the chemical composition of the pigment. Some pigments, such as cobalt and earth colours, contain elements that catalyse the accessibility of oxygen and therefore act as siccatives (speeding up the drying), with the same result as mentioned above. Also traditional lake pigments (e.g. traditional madder lakes, not used in the Rembrandt Oil Paints, here the “Permanent” madder lake is based on a modern replacement) tend to cause wrinkling. Thick or thin, certain colours and additives like linseed oil or poppy oil can increase the wrinkling risk. This also explains why the risk of wrinkling with Van Gogh Student Oil paint is less than with the artist quality Rembrandt range of oil colour. In Van Gogh Oil the quality of pigment is partly replaced by extenders. The particle size of these chalk kinds of products is relatively big when compared with the pigment itself (so relatively less oil is needed), the particles themselves “open” and therefore give access to oxygen, also to the oil within. How can I reduce the risk of my oil painting wrinkling? By adding oil to the paint, the risk of wrinkling is increased, especially with metal and pearlescent colours. It is advisable to thin the paint with a painting medium, not with pure oil. Although mediums do contain oil the wrinkling is different and therefore reduced. Although Royal Talens (makers of Rembrandt, Van Gogh, Cobra and Amsterdam paints) do try to avoid wrinkling as much as possible by adjusting their recipes, for some colours wrinkling cannot be eliminated without decreasing other quality aspects of the paint. If these kinds of colours are applied thickly, it is advisable to mix them with Painting Paste. This “painting butter” gives oxygen access to the oil within the paint as well, without changing the hue of the colour. Give careful thought to the colours you use, as well as the paint quality. Don't add oil to your oil paint. You do not need to do this. You should only add a "medium"
Can you thin it out a little with white spirit and make the paint leaner? Can you make the paint fatter and add some painting medium? If you want to paint thickly, with a high quality (high pigment content) and/or “risky colour” then think about adding some filler like painting paste. I am slightly wrinkled here and there, but I am not old yet! This entry was posted in Tips and Hints and tagged oil paint, wrinkling, painting paste, painting medium on September 3, 2015 by raxxar.